The brown, grainy tops of this stool and table are made from used coffee grounds that designer Xavier Loránd sourced from cafes near his Mexico City studio. Presented at this year's Design Week Mexico, the Nero side table and stool are the result of a series of material experiments by the self-proclaimed coffee lover. "It started as a personal project due to the love I have for coffee and everything it represents," Loránd said. "I'm from Veracruz, which is the second larger coffee producing state in Mexico." The designer, who is now based in the capital, gathered leftover coffee from nearby shops. He then paired it with binding materials like plant-based bio-resin, and left the mixture to set in a mould to create the surfaces. "We collected coffee waste near the studio for a month, then we cleaned it, washed it, sun dried it, and then ground it again to get it finer," Loránd said. "Then we added fine wood husk and started making tests with the bio-resin percentage and the mould pressing." The designer, who describes the finish as having the "texture and hardness between cork and MDF, but with the scent of coffee", collaborated on the project with concrete company Muro Blanco. He therefore also worked with concrete to complement the collection. The grainy top of the stool is set on a dark base formed from a combination of concrete and recinto – a black stone. For the side table, half of the top is the grainy coffee mixture, while the other is a smooth beige chunk that comprises a blend of coffee with concrete. "We decided to mix coffee and concrete to get something in between and," said the designer, "after several trials, the result was what we where expecting: a mocha-looking concrete." 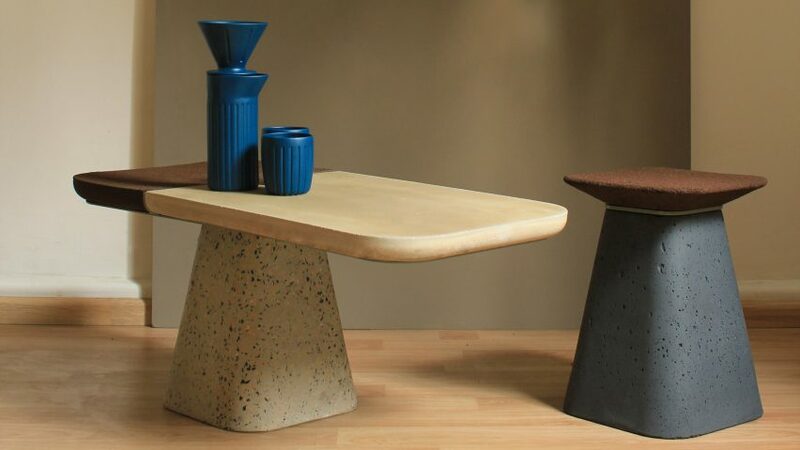 Completing the set, the side table's speckled pale base is made of concrete and terrazzo. To complete the works, Loránd also designed a blue, ceramic coffee set, named Provincia, which includes a rimmed jug and two cups. Nero and Provincia were presented at the Inédito exhibition during this year's Design Week Mexico – which ran from 10 to 14 October 2018. Last year, Dezeen picked Loránd as one of the country's emerging designers to watch, after he presented a dining chair and table made of a mix of resin and wood chips.